The main scope of work was to clean out settled grit and rag from the inlet works and channels to the far end of the works, discharging into 10 primary settlement tanks, the furthest being some 370 metres away. 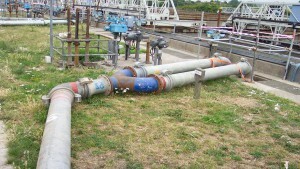 The pumping system was designed to cope with a flow of 150,000 m³/day (1,736 l/sec.) of raw sewage, at 4 metres static head and a maximum total head of 15.1 metres at the furthest discharge point. 10 off 10″ electric submersible pumps were installed in 3 separate channels within the inlet works discharging into the 10 primary sedimentation tanks. 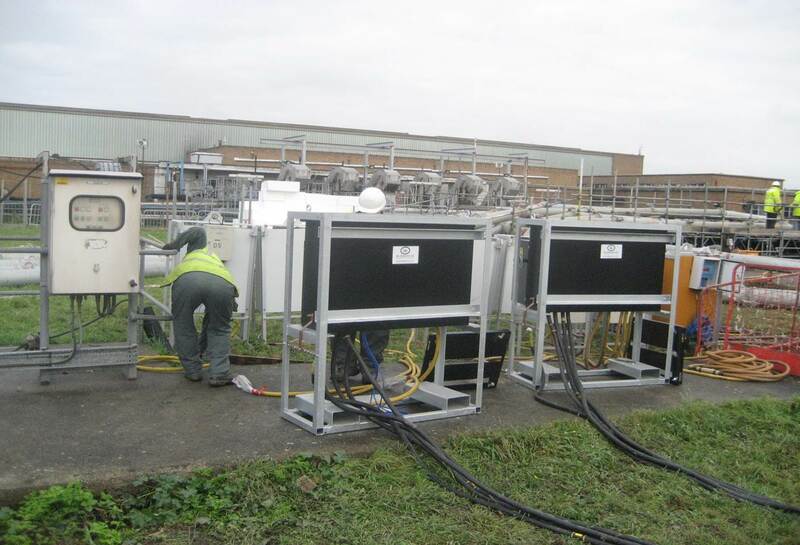 Utilising 3 Miltronics Hydroranger Plus ultrasonic level control units and transducers, we were able to control levels in all channels and rotate the flow into all 10 tanks as and when requested by operations staff. 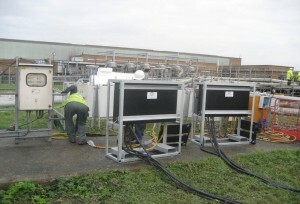 To reduce the velocity, all 10 pumping mains were split 3 metres before discharging into the tanks using “Y” splitters thus 20 discharge pipes were installed in total. 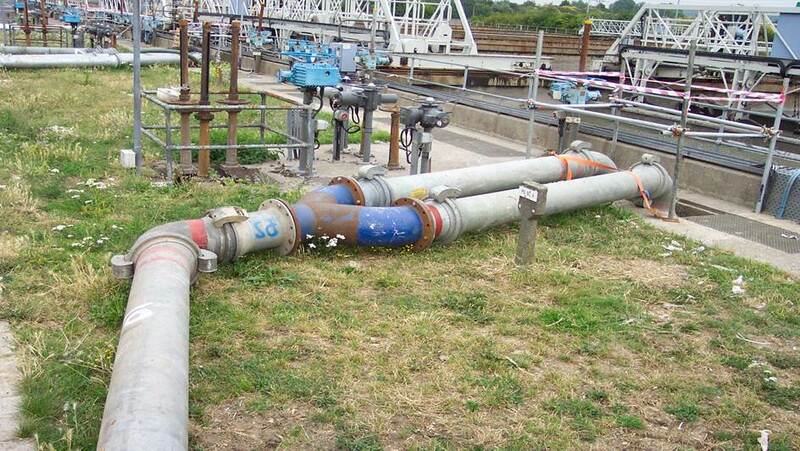 In addition to the main installation, a similar pump was installed in the first section of channel after the penstocks were closed to quickly drain down the channel and also cope with any leakage. 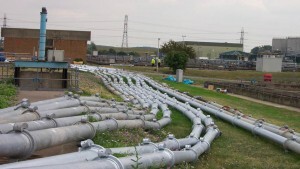 In all a total of 1,500 x 3 m lengths of 12″ light gauge steel pipes were installed along with over 100 x 45 and 90 degree bends. Mechanical installation was completed within 3 days, with full electrical, mechanical installation and commissioning being completed within 4 days. Power was provided utilising 2 x 850 KVA generators installed as duty and standby through an automatic changeover panel, distribution board and bulk bunded fuel tank. Hydrainer also provided fuel management for the duration of the hire period. The project was completed on schedule without any significant disruption, due largely to the thought given to the design of the system prior to installation.